Easy Twice Baked Potatoes are cheesy, creamy, and a make a perfect side dish to any main course. 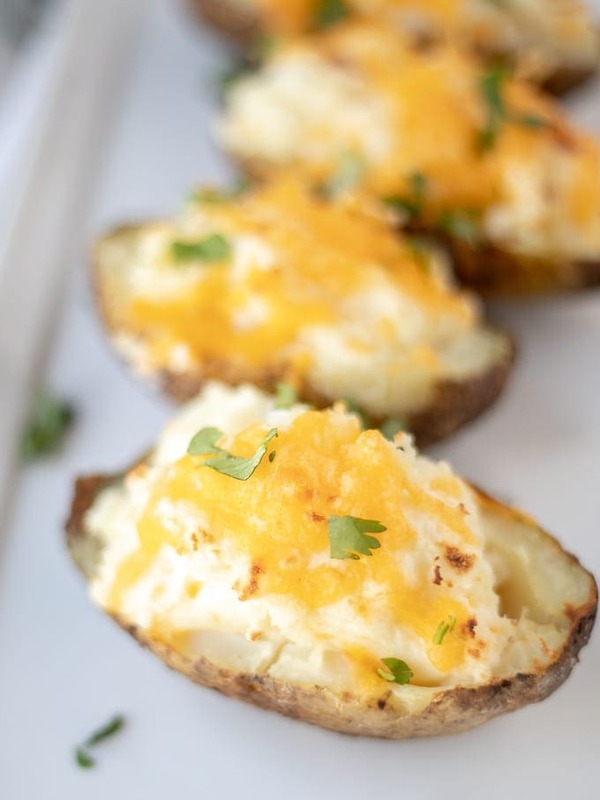 Made with sour cream, butter, and cheese and stuffed into a crispy potato skin, this Twice Baked Potato Recipe is sure to impress! These Twice baked potatoes are perfect to serve with Chicken Marsala or New York Strip Roast. And speed up this recipe for double baked potatoes by starting with Instant Pot Baked Potatoes. One of the very first things I made my husband was a steak dinner with Twice Baked Potatoes. While he loved the steak, he raved about these double baked potatoes. He never had a Twice Baked Potato before and he was hooked. 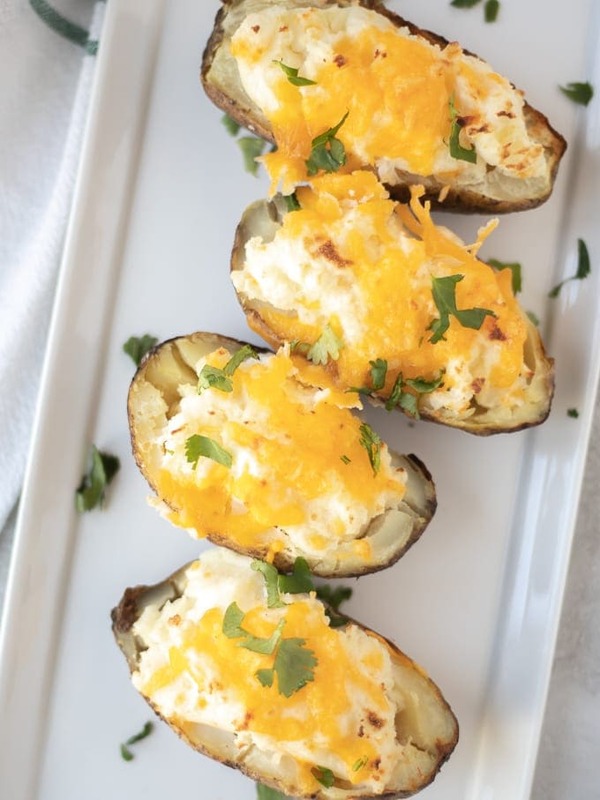 From the creamy, cheesy filling to the salty exterior of the potato skin, twice baked potatoes make a show stopping side dish yet are incredibly easy to make. A twice baked potato is a potato that has been baked once. Once baked, the inside of the potato is scooped out and mixed with butter, sour cream and cheese and then stuffed back into the baked potato and baked again. These stuffed potatoes are baked twice, hence the name, Twice Baked Potatoes. Prepare Baked Potatoes in Instant Pot or in Oven. Place scrubbed potatoes on aluminum foil. Roll potato to coat with salt and oil and then wrap in the foil. Place on baking sheet and bake at 400 degrees, until potatoes are fork tender–about 45 minutes. Once potatoes have been baked, slice potatoes in half. Using a spoon, melon baller, or cookie scoop, scoop out the flesh of the potato, leaving 1/4-1/2 inch border around potato skins. Place flesh of potato in bowl and mash well with a fork. Add in warm butter, milk, and salt and mix well to incorporate. Stir in sour cream and shredded cheese into potato filling. Place half the potato skins onto a baking sheet. Sprinkle potato skins with salt and pepper. Generously fill the stuffing into the potato skins. Top with additional cheddar cheese. **I like to stuff these double stuffed potatoes so that they are heaping full of the stuffing. If you would like to JUST stuff your potatoes, you will need to fill all 8 potato skins. Return stuffed potatoes back to the oven and bake until cheese is melted and filling is warmed through. These double baked potatoes are great to make in advance. Prepare potatoes up to baking for a second time. Place prepared Twice Baked Potatoes in air tight container. Store in fridge for up to 3 days before baking. Bake twice baked potatoes at 375 degrees for 30 minutes, or until warmed through and cheese is melted. Place potatoes on baking sheet and freeze until solid, about one hour. Remove potatoes from baking sheet and place into air tight container or freezer safe bag. Place potatoes in freezer for up 3 months. Place frozen potatoes on baking sheet. Bake twice baked potatoes at 375 degrees for 60 minutes, or until warmed through and cheese is melted. Mash the Twice Baked Potato filling with a fork while the potatoes are still warm, as this will make for easier mashing. I do NOT recommend using a hand held mixer to mix the potato filling, as this will cause your potatoes to get gummy and not taste as delicious. Feel free to use Greek yogurt in place of sour cream in these Twice Baked Potatoes. I love adding 1/2 teaspoon each of garlic powder and onion powder to the potato mixture for additional flavor in these Double Baked Potatoes. Use any cheese you like for these potatoes. Twice Baked Potatoes are also delicious topped with pre-cooked bacon as well. If you enjoy watching these videos make sure you subscribe to my YouTube Channel to be notified each time a post a new video!I would love to know how you enjoy this recipe! 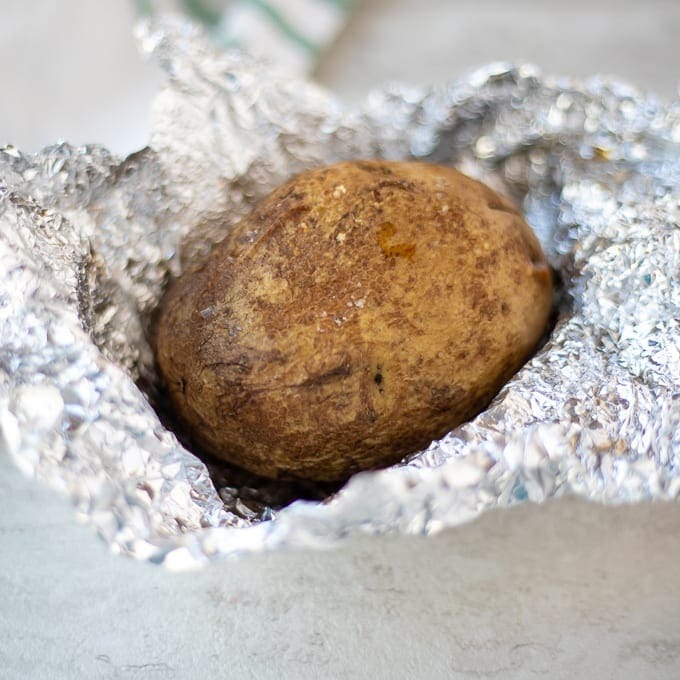 To Bake Potatoes in Oven: Place scrubbed potatoes on aluminum foil. Drizzle with olive oil and sprinkle with 1 teaspoon salt. Roll potato to coat with salt and oil and then wrap in the foil. Place on baking sheet and bake at 400 degrees, until potatoes are fork tender–about 45 minutes. Once potatoes have been baked, slice potatoes in half. 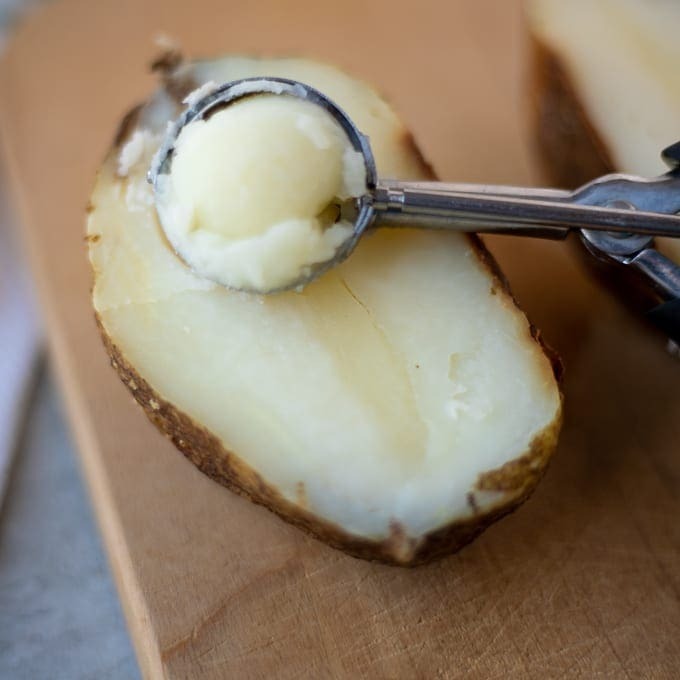 Using a spoon, melon baller, or cookie scoop, scoop out the flesh of the potato, leaving 1/4-1/2 inch border around potato skins. Place flesh of potato in bowl and mash well with a fork. Add in warm butter, milk, and salt and mix well to incorporate. Stir in sour cream and shredded cheese into potato filling. Place half the potato skins onto a baking sheet. Sprinkle potato skins with salt and pepper. Generously fill the stuffing into the potato skins and top with additional cheddar cheese. Return stuffed potatoes back to the oven and bake for 15 minutes, until cheese is melted and filling is warmed through. I love a good recipe for twice baked potatoes! Delicious! Yay!! So glad this recipe hot the spot. Baked potatoes are always good, but wow…these were OVER THE TOP. And I love your smart tip for starting the potatoes in the Instant Pot!